Can I remove the chat box logo? This feature is only available in PRO package. Groups are a feature of Smartsupp, which is extremely useful when you have multiple agents, and you want to route chats from specific parts of your web to the specific agent. If you have a multilingual website, you can route chats from the English part of your website to your English speaking agent and so on. You are using Smartsupp on multiple websites, and have different agents for each of these websites. You are selling different products on your website, and you want your visitors to always be served by a specialist in that particular field. How to set up groups? After that, create at least 2 groups by clicking on Add group (2) button in the top right corner of your screen. 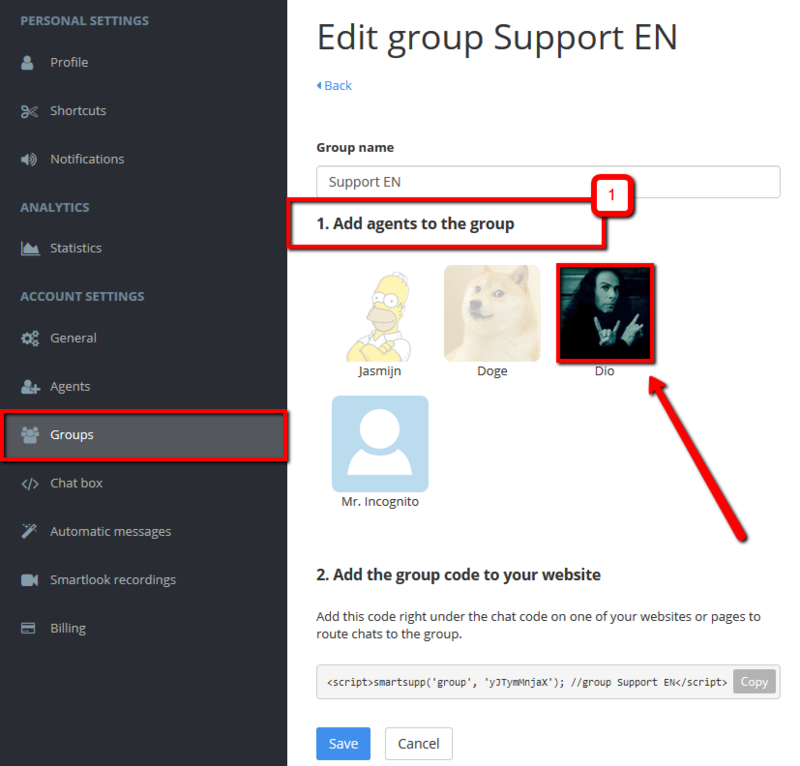 Assign all of your agents (1) to the created groups. Even one unassigned agent can change the status of chat on your whole website, which you probably don’t want. You can easily assign agents to the specific group, just by clicking on their photo in group settings. The number of agents for each group is unlimited. Note: After all of your agents are assigned to groups, they need to REFRESH their dashboard, for changes to take effect. Add the group code right under the chat code on one of your websites or pages to route chats to the group. You need to insert the group code after the Smartsupp chat code. If everything is set up properly, and your agents refreshed their dashboards, they should see the group of every new visitor in visitor list (they can only see visitors from groups, where they are assigned to).